BlackBerry 10 L-Series caught in new photo? RIM has managed to stay relevant and keep interest in its BlackBerry 10 operating system alive both through official announcements and inadvertent leaks. While the company likely isn't to blame for a BB10 handset image that surfaced Thursday, it probably appreciates the publicity. 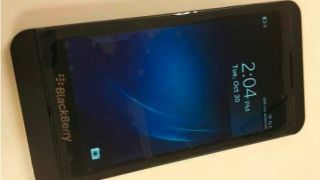 The image in question purportedly shows the L-Series, otherwise known as the touchscreen phone that will cradle RIM's forthcoming OS early next year. Nothing new is revealed, though the image shows clear frontal detail and the same lock screen found in BlackBerry 10 Dev Alpha A and B handsets. RIM has repeated the "it's coming" sentiment surrounding BlackBerry 10 for months now, and on Wednesday announced the OS and accompanying devices are on track to arrive in early 2013. CEO Thorsten Heins confirmed that more than 50 carriers are in the midst of testing BB10 and according to him, response to the new operating system has been "tremendous." Along with the touchscreen L-Series, RIM is also reportedly preparing a QWERTY-equipped N-Series phone. Looking back at the L-Series, there's something iPhone 5 about it, so if design doesn't set it apart, hopefully BB10 will.